Can this man's chimney save the planet? How a small-town engineer finds himself in the fight to end global warming. (Fortune Magazine) -- "This is my sandbox, where I play," says Tom Kiser, pulling his big Chrysler sedan into the parking lot of Professional Supply Inc. We're in Fremont, Ohio, population 17,000. There's a sauerkraut factory across the street, a fitting neighbor to Kiser's dreary, plywood-paneled headquarters. Kiser was born and raised in Fremont. He founded PSI here in 1979 with an $80,000 SBA loan backed in part by his wife's wedding ring, and he's done well enough that he now owns a seven-passenger company jet. But that's not the story. The story is how a small-town heating and ventilation engineer with no illusions about his customers' true priorities ("What makes me go is, Can I make you money? If I can't, don't hire me") suddenly finds himself on the front lines of the fight to halt global warming. 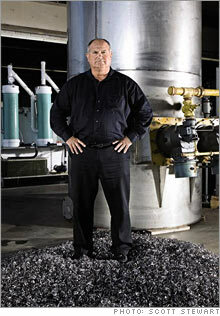 CO2 Buster: Tom Kiser, at his Fremont, Ohio, shop, stands on a pile of stainless-steel rings used in his liquid chimney (background) to help filter out greenhouse gas. A. A natural-gas boiler sends its exhaust, laden with the greenhouse gas CO2, through a pipe to Kiser's liquid chimney. B. As the exhaust rises through a layer of plastic or stainless-steel rings, it is mixed with treated water (the ingredients are secret) in a process that captures most of the CO2. C. The result: hot water (which is recycled to save energy) and calcium carbonate, which can be fashioned into building blocks, deposited in the ocean to replenish coral reefs, or returned to the earth. His weapon? A new experimental technology he calls a liquid chimney that captures the greenhouse gas escaping from coal and natural-gas furnaces and turns it into a harmless material that could be used in construction or even dropped into the ocean to rebuild coral reefs. The impact could be huge, considering that half the greenhouse gas that America generates comes from burning coal and natural gas. Kiser got rich by figuring out how to slash energy costs for small and large companies, including Ford Motor. His River Rouge Ford project was a collaboration with William McDonough, one of the world's leading environmental architects and co-author of "Cradle to Cradle: Remaking the Way We Make Things." These two highly unlikely bedfellows met in 1999 when McDonough pulled Kiser in on the most ambitious green project ever undertaken by an American corporation - the $2 billion retooling of Ford's historic, smoke-belching River Rouge factory complex into a model for sustainable manufacturing. Kiser's main contribution to the Rouge project - and 11 others he's done for Ford - was Bigfoot, his patented alternative to the traditional coal-fired, steam-generating heating and ventilation system. Bigfoot essentially replaces a coal-burning furnace and miles of ducts with a few efficient rooftop gas units that promote air circulation, recover waste heat, and keep the workplace comfortable. According to Jeff White, Ford's energy efficiency manager, Bigfoot is saving Ford (Charts) more than $50 million a year in fuel costs while cutting annual carbon emissions by 257,000 tons - the equivalent of taking about 35,000 cars off the road. "This is just a huge success for Ford," says White, "way exceeding everything we thought we'd get out of it." What makes Kiser stand out from the clean-tech crowd is the sheer ambition of what he's trying to do. "There are a lot of people who want to fiddle with bits and pieces of the puzzle, like how to make a better solar collector," says McDonough, who by now has made at least as many pilgrimages to Fremont as he has to Davos, Switzerland. "But there aren't that many people who are ready to tackle a chimney and drag it down to the ground by sheer force of will. In Fremont, Ohio!" Kiser, 55, looks almost capable of that chimney trick - I mean, literally. He's six-one and 290 pounds, and he comes at you like John Madden on "Sunday Night Football" - shoulders heaving, arms waving, vocal cords straining, grammar out the window. Like Madden, there's nothing in the world he cares more about than whatever he's trying to make you understand right now, and because he cares, you get it. Kiser studied aeronautical engineering in college. He wanted to be a pilot until the first time he sat in a pilot's seat. ("I didn't fit! I got in the cockpit and I couldn't move!") After college he went to work for a wholesale refrigeration and heating supply company. There he developed a passion for complex industrial ventilation systems that today exceeds, if barely, his passion for football. His college football career ended when he blew out his knee. Still, he played semi-pro ball into his mid-20s, earning a contract offer from the Washington Redskins, which he turned down in favor of starting his own business. Eventually he switched to coaching. Kiser has been a special assistant to Ohio State head coach Jim Tressel. That glittering rock formation on his ring finger is what he earned for his sideline work during the Buckeyes' national championship season in 2002. Outwardly, Kiser is no different today than he ever was. He still tools around Lake Erie on a twin-V8, 34-foot powerboat, flies where he needs to fly in his jet, and prefers comfort to fuel economy in his cars (his son Russ, a 10 percent owner of PSI, drives a Hummer). He's not a tree hugger, in other words, and he refuses to play the green guilt card with his customers; remember, he doesn't want your business unless he can help your bottom line. But something changed when he met McDonough. "I'm one of them little Americans," Kiser says, describing the man he was. "I'm so busy raising my family, coaching football, doing this and that. You get all wound up in your cocoon, and one day all of a sudden you realize, 'Yeah, there are some big issues here.' You think terrorism is bad? Wait till you see global warming when it goes hiccup. It won't care where the innocent and the guilty live." Kiser is on a mission. He believes that if we don't attack the greenhouse-gas problem soon, with everything we've got, and somehow get the Chinese to join us, we're cooked. After all, China has the world's largest coal reserves and at least 150 greenhouse-gas-spewing power plants on the drawing board. On a recent trip to China with Miansheng Wang, managing director of the nonprofit China-U.S. Center for Sustainable Development, Kiser was escorted by police motorcade to Shanghai's seven worst polluters to conduct hands-on energy audits. He was the first foreigner ever appointed an energy-efficiency advisor to the Shanghai Municipal Economic Commission. "For dinners he put on a suit and tie and looked like an American Senator," says Wang, "but during the day he wore his jeans and took pen and notebook and climbed up and down huge boilers." What Kiser hopes to sell to the Chinese and others lies hidden back at PSI headquarters in Ohio, where he has built a prototype of his liquid chimney. The basic technology for liquid chimneys - so called because the exhaust from a power plant is filtered through a liquid-filled tank - has been around for 30 years. Kiser, however, has made his patent-pending system more efficient and believes that he is close to a working model that could be retrofitted to existing industrial furnaces or boilers that run on natural gas. Eventually he hopes to get the technology to work with any fossil fuel, including coal. It's not just the right thing to do. The chimney captures wasted heat, which boosts the efficiency of the system and saves on fuel costs. Making the liquid chimney commercially viable won't be easy. "Sounds a little far-fetched," says venture capitalist Michael DeRosa, managing director with green investor DFJ Element in Menlo Park, Calif. "We've made great progress in power generation in capturing other particulates - nitrous oxide and sulfur oxide and carbon monoxide - but capturing carbon dioxide has been more elusive. Obviously if it worked and was cost-effective, it would be extraordinarily attractive." Cary Bullock, CEO of GreenFuel Technology in Cambridge, Mass., which has a device that converts smokestack emissions into biofuels, knows how hard it is to bring such technology to market. "There's a lead time for anything with dramatic effects," Bullock says. "People look at it and say, 'How could we possibly ...?' It's not easy to save the world." Kiser knows that, and yet he's plowing ahead. He hopes to install the first liquid chimney in a factory being built by POM Wonderful, a pomegranate juice maker in Los Angeles, that would more than meet the state's stringent new greenhouse-gas emissions requirements. The POM juice project represents the coolest Kiser-McDonough collaboration since River Rouge. POM's billionaire owners and serial entrepreneurs, Stewart and Lynda Resnick, believe they can "save the world with antioxidants from pomegranates," says Erich Fritz, head of operations at POM. With annual retail juice and tea sales of $98 million, according to Chicago marketing consultancy Information Resources, POM aims to triple its pomegranate crop over the next few years and needs to build more capacity. POM is still in the chalkboard phase, Fritz says, looking at Kiser's liquid chimney and solar power and "crazy, wild stuff, like how do we make our own water?" This isn't think-tank theorizing, he insists, but smart business." Will we consume no resources?" says Fritz. "Not practical. But I guarantee we will consume less energy, with less environmental impact, than we are today." Kiser doesn't like to be called a visionary. "I'm a solutions guy," he says. And so the question haunting Kiser these days is, Will what he's doing be enough? Even if every manufacturer in America were to dramatically transform its operations tomorrow, would that stave off an environmental disaster? Kiser can't know; all he can do is act. "All right, hot damn, you know what?" he says. "If there's no God, man, we're on our own. We'd better get busy. If there is a God, yeah, there's a lot of things I'd like to hold him accountable for. But I don't get to talk to him till the next deal. And I'm really afraid when I get there, he's gonna say, "I'd like to ask you the same question: What in the hell were you doing down there?"